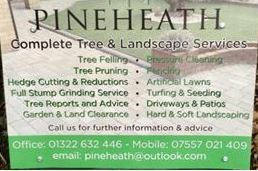 Pine Heath Tree & Landscapes Solutions - Landscaper , Tree Surgeon based in Swanley, Kent. After several years experience I established my own company in 2014. At Pine Heath Tree & Landscapes Solutions we pride ourselves on our attention to detail and always work closely with customers to ensure all work is completed as you would like and to high standards. We work hard to create as little disruption as possible to your every day life. We are friendly and professional and always aim to exceed expectations. We can help with all of your Tree services, Driveways, Patios, Paving, Fencing, Turfing/Artificial Lawns Landscaping and general Garden Services needs.